Most everyone will agree that we love our San Diego. But in speaking of our community, there must come the acknowledgement that there is a terrible phenomenon taking place both here and across the country. It’s a phenomenon that many are completely unaware of. Even more disturbing is that there are those who are very much aware of it, are profiting from it and/or are indulging in it. The worst part of all of this is that little girls, little boys, women and men are being enslaved and brutalized by it EVERY DAY. Through force, fraud and/or coercion…these human beings are victims of the crime known as HUMAN TRAFFICKING, and San Diego is one of the top 7 cities in America where this is happening. 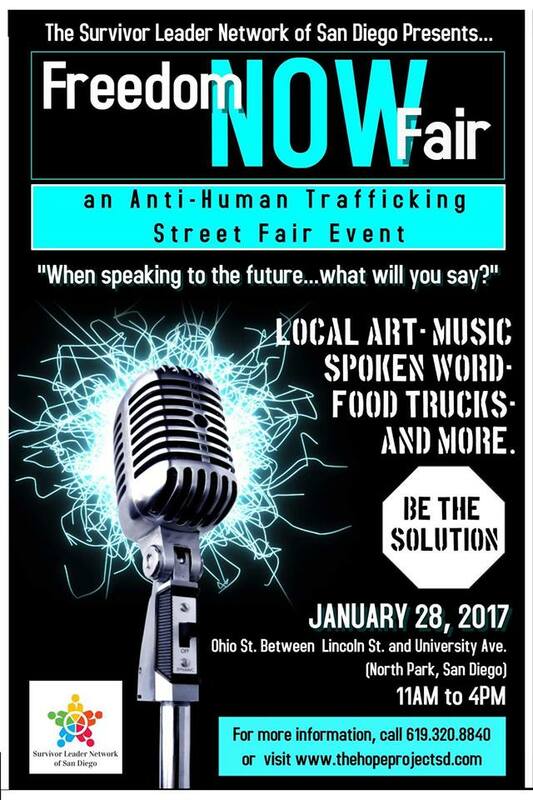 There is a need to bring the topic of human trafficking down to street level, so that more people are aware of this critical issue facing our society today and that is taking place in our own back yards. In order to help eliminate this tragic injustice, there is a need to change the way the public thinks about this issue as well as a need to empower them with the education and resources in order to become an ally in this mission. With these things in mind, we are very excited to announce that the Survivor Leader Network of San Diego is moving forward with our 2nd Annual “Freedom NOW Fair” on January 28rd, 2017…WE HAVE MORE WORK TO DO!!! Corner of Ohio St. & University Ave. Registration for organizations wishing to have a table at the event will open on October 15, 2016 and will close on January 23, 2017. For more information on this exciting event, click here! This entry was posted in Activities, Raise Awareness, Uncategorized by Patrick Erlandson. Bookmark the permalink.